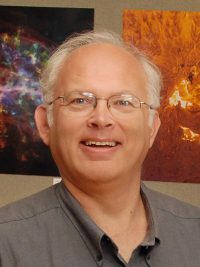 Professor Keel’s research is broadly centered on the evolution of galaxies, including studies of galaxies and groups at high redshifts, ultraviolet studies of nearby galaxies as points of comparison for objects seen at higher redshift, and infrared observations to measure the ages of stellar populations in the early universe. Through study of galaxy clusters at intermediate redshift and through studies of star formation triggered during galaxy interactions, he examines examines how the environment can influence galaxy evolution. In collaboration with Professor White, Dr. Keel has used the backlighting afforded by overlapping galaxy pairs to measure the effects of dust in spiral galaxies. This work has led to detailed mapping of the dust in several spiral galaxies and to more work on the distribution and history of dust in galactic nuclei. These projects involve observations with ground-based optical and infrared telescopes, the Very Large Array and James Clerk Maxwell radio telescopes, and such space-borne facilities as the Hubble Space Telescope, Infrared Space Observatory, and shuttle-based Starlite payload. Professor Keel received his doctoral degree from the University of California-Santa Cruz in 1982. He joined the faculty of The University of Alabama in 1987.